‘Frente por Puerto Rico’ continues meetings in D.C.
From left: Gov. Rosselló, former Gov. Acevedo-Vilá and Carlos Mercader during one of several meetings in DC. Gov. Ricardo Rosselló, visited U.S. Congress, along with former governors Pedro Rosselló and Aníbal Acevedo-Vilá, as part of the “Frente por Puerto Rico’s” mission to achieve the island’s inclusion in federal legislation related to healthcare, tax reform, and disaster recovery after hurricanes Irma and María. Rosselló and Acevedo-Vilá visited congressman José Serrano (D-NY) and discussed the need for him to exercise his leadership to have Congress consider Puerto Rico’s inclusion in the supplementary aid package that is being evaluated. Additionally, both spoke with senator Roger Wicker (R-MS) about federal tax reform. Wicker highlighted, as did Serrano, the importance of former governors of both parties having joined the current governor in the pursuit of the best interests of the people of Puerto Rico. At the same time, Wicker affirmed that he would lend a hand in guiding other senators on the importance of the island being considered in the tax reform legislation. Meanwhile, Rosselló and former Gov. Pedro Rosselló met with senator Tom Carper (D-DE) and talked about the need to rebuild a more robust power grid for Puerto Rico in view of the geographical reality that exposes the Island to extreme atmospheric events. 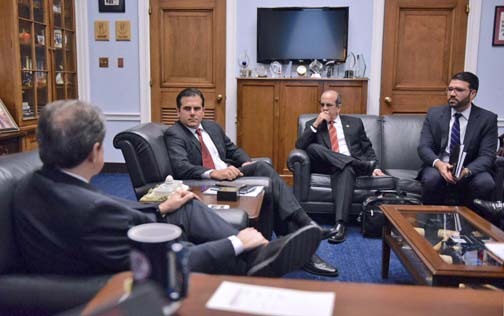 Also, Rosselló and Carlos Mercader, executive director of the Puerto Rico Federal Affairs Administration in Washington, met with the chairman of the House Committee on Natural Resources, Rob Bishop (R-UT). At this meeting, the governor and Bishop discussed the need to analyze the regulations and processes of the Federal Emergency Management Agency (FEMA) to improve the effectiveness and speed of recovery efforts and response after the hurricane. On the other hand, the governor, Mercader, and the Puerto Rico Treasury Secretart Raúl Maldonado, met with the chairman of the Senate Finance Committee, Orrin Hatch, and his team, to discuss the importance of the island being considered in the federal tax reform. Wednesday afternoon, Rosselló visited the White House to hold a meeting with Elaine Duke, interim secretary of the Department of Homeland Security; Tom Bossert, advisor to the White House on Homeland Security; and his team. Rosselló reiterated the delay in the deployment of brigades of the United States Army Corps of Engineers (USACE), an entity that guaranteed that resources would be available on the island within 45 days to work on the recovery of the power grid. However, just over 30 days after having signed the agreement between the Government of Puerto Rico and the USACE, only seven brigades have been deployed in Puerto Rico. At this meeting, Rosselló was joined by Héctor Pesquera, secretary of the Puerto Rico Department of Public Safety; Alfonso Orona, chief legal advisor of La Fortaleza; and Mercader. In addition, the governor spoke with Seema Verma, administrator of the Centers for Medicare and Medicaid Services, about the healthcare funds needed to avoid the fiscal cliff in the Medicaid health program for low-income individuals. Lastly, a working table was held with advisors of the White House’s Intergovernmental Affairs, the U.S. Department of Health, the U.S. Office of Management and Budget, and FEMA to follow up on the recovery efforts after the hurricane, as well as equal treatment for American citizens living in Puerto Rico. Pray tell…what is the difference between a PR-American, a Polish-American, a Native-American, an English-American, or any other living in P.R. or any state? Well, the only one easy to spot is the exemption from U.S. personal income taxes for P.R. Americans living in P.R. not elsewhere. This is because the Congress owns P.R. and allows the fiction of a Free, associated State, called a Commonwealth while the official words in Spanish “Estado Libre y Asociado tell the truth to the supporters in P.R. of the Populares political party as opposed to the Statehood Party, now in power on the island. The only solution for the future is to either pay alimony to a new free and associated state, or make it a state to be heavily subsidized by more entitlement programs and pay its huge debt. Why not let it be free, sell its utilities to pay some debt and leave the old debt in the vacated government? Some relief may be part of the friendly divorce negotiation. Hey Buddy!, I found this information for you: "‘Frente por Puerto Rico’ continues meetings in D.C.". Here is the website link: https://newsismybusiness.com/frente-continues-meetings/. Thank you.